Live blogging: Will fix typos later! Today, I'm attending Transparency Camp West 09. Here's the elevator speech grabbed from the Sunlight Foudation blog that Jake Brewer (who was sitting next to me and blogging) just posted. Transparency Camp is an unconference designed to convene a trans-partisan tribe of open government advocates from all walks — government representatives, technologists, developers, NGOs, wonks and activists — to share knowledge on how to use new technologies to make our government transparent and meaningfully accessible to the public. The participants are a who's who of open government and transparency movement from many perspectives - geeks, journalists, healthcare, nonprofits, government, citizen engagement, and advocacy. The above visual is a representation of the 3 word introductions that people shared at the beginning of the conference taking place at Building 40 at Google. As part of the housekeeping rules, we were told that everything was open in terms of blogging, tweeting, etc, but to respect when someone says its off the record and to ask permission for photographs. We were also told that we can't take videos inside the building and if shooting outside that had to be sure that we were not capturing anything that could be seen through the transparent office windows. 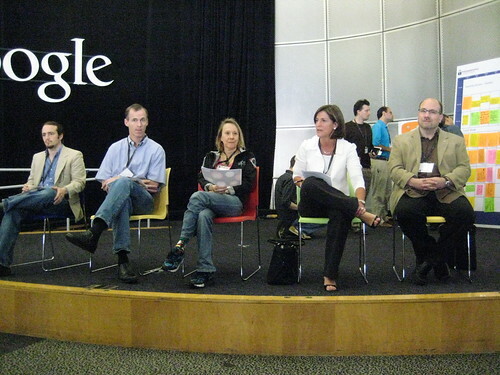 My sole interest in attending was to learn more about transparency as it might apply to the networked nonprofit. One of the questions that Allison Fine and I are exploring in our book is: "What does governance look like for the networked nonprofit?" This is more than putting information out on the web. So, kismet - the first session of the day was described as an "Open Board Meeting" of the Sunlight Foundation with Ellen Miller and the board members. The session started off with some context about how the organization got started and why, and an overview of programs. Each of the board members introduced themselves and spoke about why they were involved with the organization. Staff members for each of the four main areas got up and spoke about the work they were doing and what was on the horizon. What does Sunlight Foundation look like ten years from now? Ellen Miller said the need for an organization like Sunlight Foundation will have disappeared because the core of our mission is that government will see making data available as part of their role. We'll have more of an emphasis on helping people make sense of the data. Esther Dyson added that "Not only will government will be doing the right thing, but citizens will expect it. Moving forward our job would be to teach people statistics" This made me think of the recent article in the New Times about the growing importance of statistics. I think Esther Dyson was talking about citizen statisticians, not necessarily experts or perhaps social data visualization. With five minutes left to go in the session, I couldn't resist asking/tweeting, "Is this what talk about at your other board meetings? Can transparency of nonprofit governance make nonprofits transparent? I got a terrific round of answers from the board and Ellen Miller. They normally discuss business matters at the meetings, including online information, review finances, discuss particular projects, and new strategies. As Craig Newmark said, "They're not totally boring!" I followed up with a more general question, "Should nonprofit boards/governance be totally transparent? Is that good or bad thing? Are there degrees of transparency?" Esther Dyson said that transparency should be able the results and any deals, but there is a place for private discussion. "We could all go around naked and look like angels, but in the real world that doesn't happen." Transparency has its benefits, but so does privacy. As Esther Dyson said, "There is a need for respect - of relationships, to get trust, and further understandings. You can't be fully transparent all the time because you need to give people a safe place to have the discussion without disrespecting others." The point is that there are different levels of transparency for nonprofits and it is knowing where that line is and how transparency can make the organization more effective. As one of the Sunlight Foundation staffers mentioned at the beginning of the session, that many board meetings take place in secret, a lot has to do with a cultural shift. 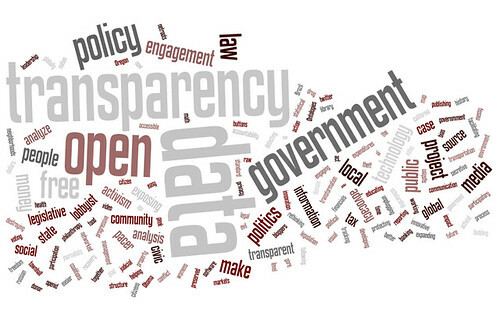 What do you think transparency for nonprofit governance/boards will look like in the future? How will social media play a role? So glad that you joined in at Transparency Camp this weekend. I had a great time there too. We now have government agencies striving for transparency and you ask about the applicability for non-profits. But why stop there? How about private companies too? I believe transparency will "spill over" from government to non-profits and forward thinking for-profit companies as well. After all, the most important outcome of transparency is improved performance. What non-profit Executive Director or private company CEO wouldn't want that? I'm so glad that you're addressing this. Too often, and for too long, nonprofits have denied those they serve the truly democratic access that they deserve; to me, it's not a matter of not having any 'secrets'--it's about establishing a culture of openness that flows both ways and that views (my particular interest is in social justice and social service NPOs) those who receive services as co-creators of social change and valued participants in meaningful work. I can't wait to see the examples you have--part of my work is in trying to help NPOs develop processes to enhance democracy and transparency, and I'm excited to see how social media can play a role in that. great post, really interesting subject... radically transparent non-profits Rise Up! Did anyone mention a way to address competition? For example, competitive grant applications.